On a cold March morning in southern Minnesota, a handful of trucks and a passenger van pulled up in front of a small house on the outskirts of Waseca, MN. Surrounded by farms and gravel roads, the house stood quiet, and empty. Months earlier in late summer 2016, the entire area experienced downpours resulting in over 14 inches of rain in 2 days. Basements flooded in homes when the ground could no longer take on the water. This was one of those homes, and 5 months later it still had water in the basement, and an owner in desperate need of help. The home was badly damaged, the furnace and power were off due to the water in the basement. The house unlivable with mold growing up the walls and the contents of their life left behind as they sought another place to stay. All of it now covered in mold, all of it needing to be removed. At NECHAMA, we pride ourselves on making sure everyone who needs help gets it – that no one is left behind. So the moment the homeowner bravely came forward to say they needed help, despite any embarrassment they had about their state of the house, we immediately moved forward to help. In this age where so much divides us – not the least of which the manner in which we pray or choose to believe – I felt a swell of pride pulling up to that house, and watching as staff and volunteers from NECHAMA were joined by their counterparts from International Orthodox Christian Charities and ICNA Relief USA (Muslims for Humanity). 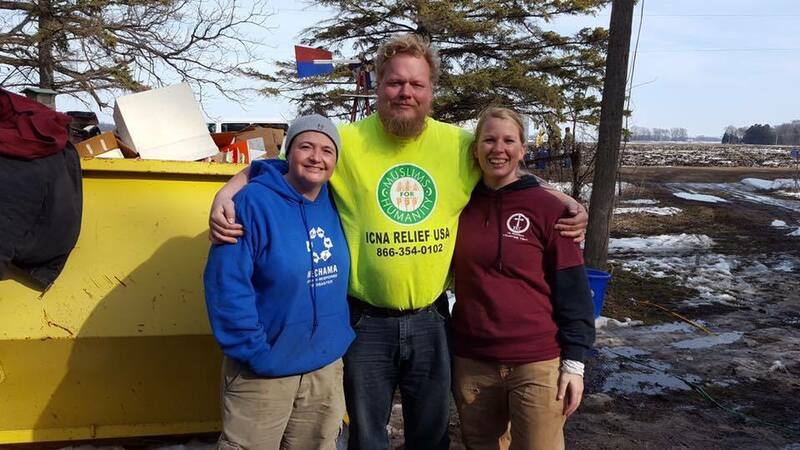 Here, next to a corn field in southern Minnesota – Jewish, Christian and Muslim organizations came together to help a neighbor in need. Working side by side in freezing temperatures and often blinding snow. Laughing, sharing stories, and proving that what unites is us far more than what divides us. In two days we filled close to 10 dumpsters worth of items, dried out the basement, and prepared the house for the next phase of its recovery. More than once while I was interacting with locals, I found them shocked and thankful that someone was there to help this family – and even more stunned when they saw the Hebrew on our shirts and the look on their eyes as they saw the shirts of our colleagues. And then, the smiles, the thank you, and the realization that we are all one community. This was my experience on my first deployment with NECHAMA, and is what brought me to this organization. The opportunity to make a difference in our community and find those things that bring us all together.